Well hello and happy Monday, friends! It's been a long time coming, but I'm excited to share with you guys our slate room/living room makeover reveal! I first shared our game plan for the room in this post. Want the quickie version of our goals? 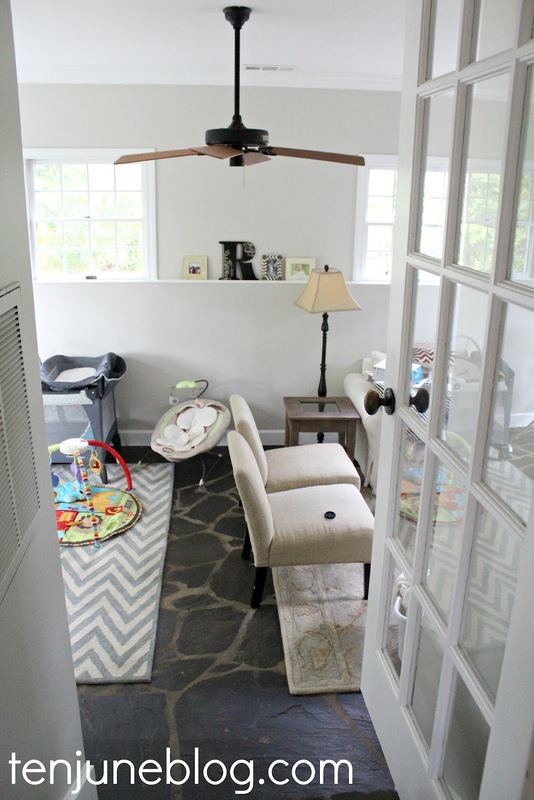 Move our main living space from our living room to the empty den/family room in our house, in order to have more space for baby H and his baby goods. Between the toys, the gear, the play areas, etc., I never realized how much space one tiny human could possibly need! David and I affectionately call the den the "slate room" because of it's gorgeous slate floors. Yeah, we're totally genius with that nickname, aren't we? Just call me Captain Obvious. For the past two years, this room has sat completely empty in our house, believe it or not. Before, the room was painted a dark brownish, orange. Also known as hideous. 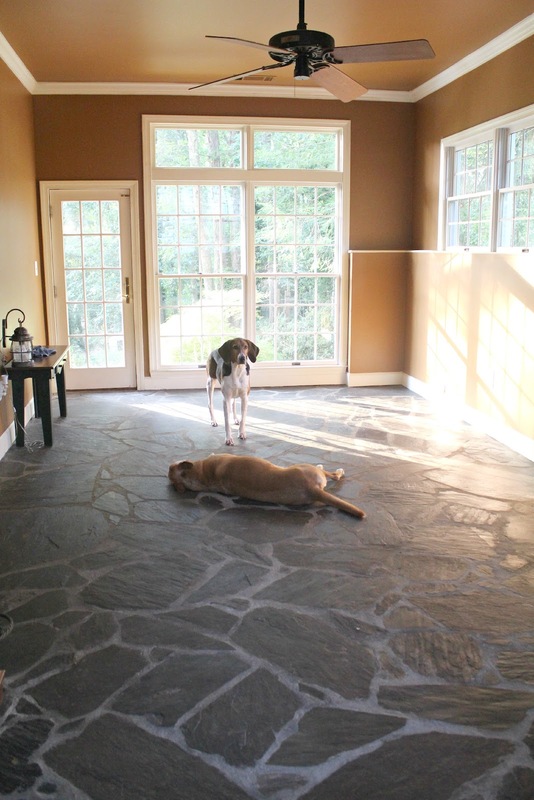 At least in this room- the paint color coupled with the slate floors created a cave-like feeling in the room. Not the look I was going for! 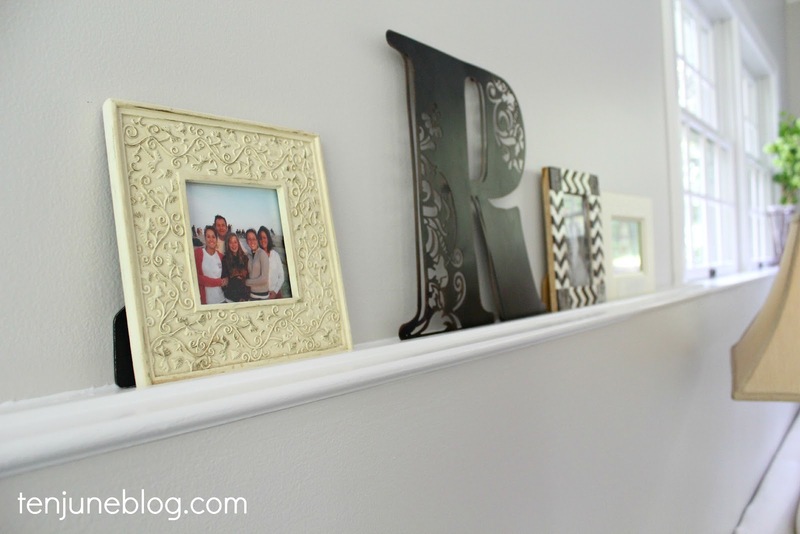 Once we took our house off of the market, I knew I wanted to redo this room before the baby came. 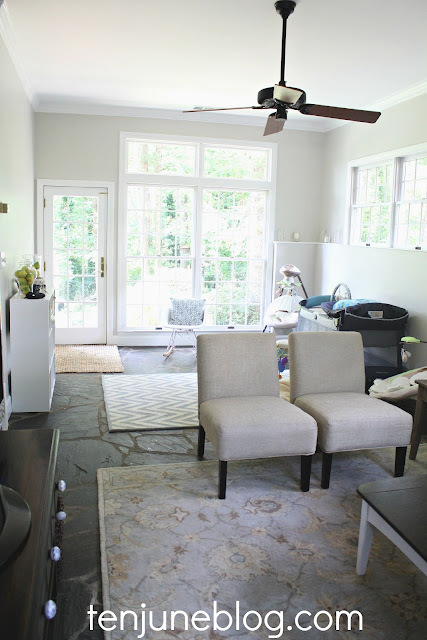 If he and I were going to be hanging out around our casa all of the time for the first few weeks of his life, we might as well do it in a space we love, right?! So I did what I do best and came up with a to-do list for the room. Woot woot. And I've actually accomplished a lot so far from that list! 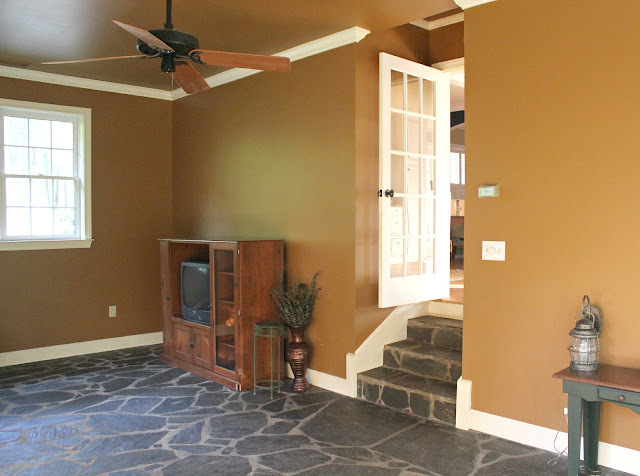 The last you heard, we had painted the room (with Behr's Mineral paint, the same that's in our kitchen). But here's what else we've done lately. 1. 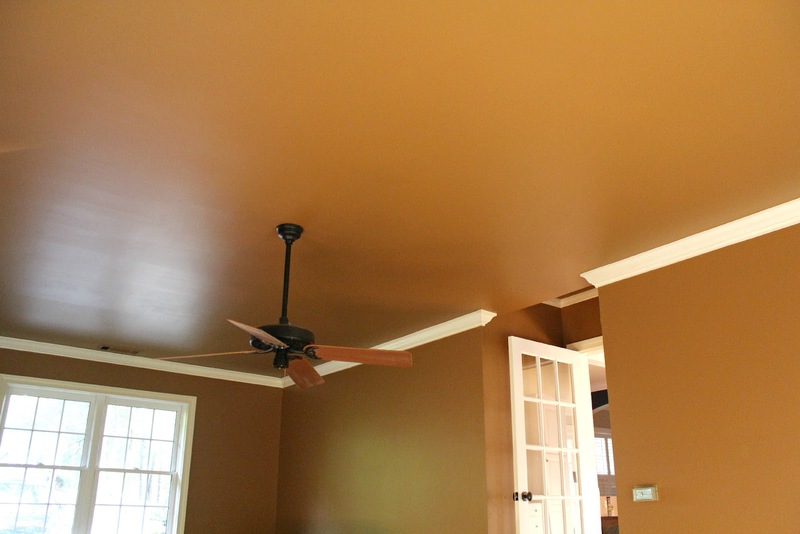 Paint the room, including ceiling, walls and trim. 2. Move living room furniture into the room. 3. Potentially buy a new sofa/ sectional. 4. 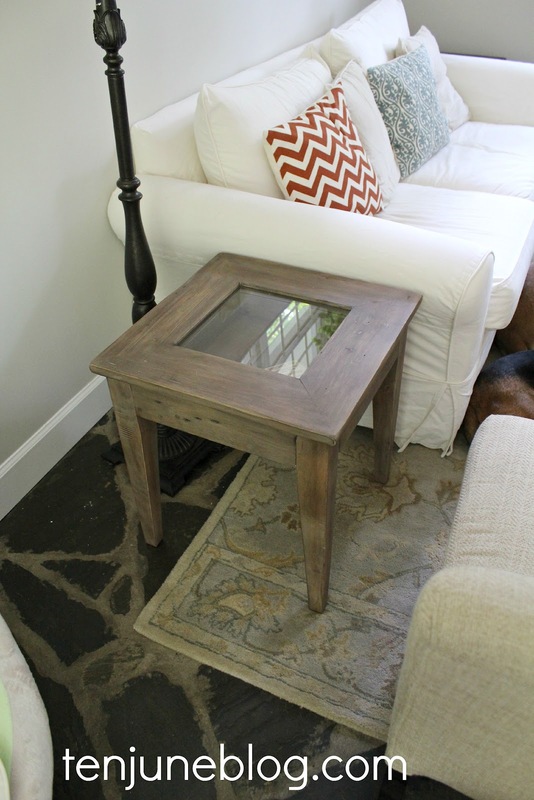 Purchase a new console table. 5. Purchase a new rug to anchor the baby's play area. Want to see all of this in action? Welcome to our revamped slate room! I had mentioned that I wanted to purchase a console table to break up the space between the TV area and the baby's area. But I decided that my old living room Target slipper chairs were enough to do that. Instead, I bought new end tables! They're the Gia Showcase table from World Market- I picked them up on sale for $99 each plus I had a 20% off coupon. Score. I love the rough natural wood finish of the tables- they bring such a great texture to my living room. All of the other furniture and decor in the room came from our living room. The room is certainly not decorated exactly the way I want it right now (yes, those are empty picture frames at the end of the ledge! ), but it's certainly getting there. 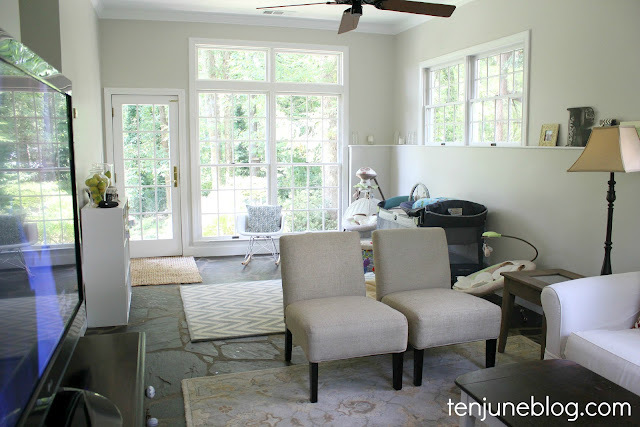 The baby's space is on the far side of the room, near the window wall. And the other half of the room is a more traditional living room format for TV watching, etc. Just like I planned, I picked out a fun rug (the Hayden Zig Zag rug from Pottery Barn) that matched our current living room rug to sort of define the baby's play space. 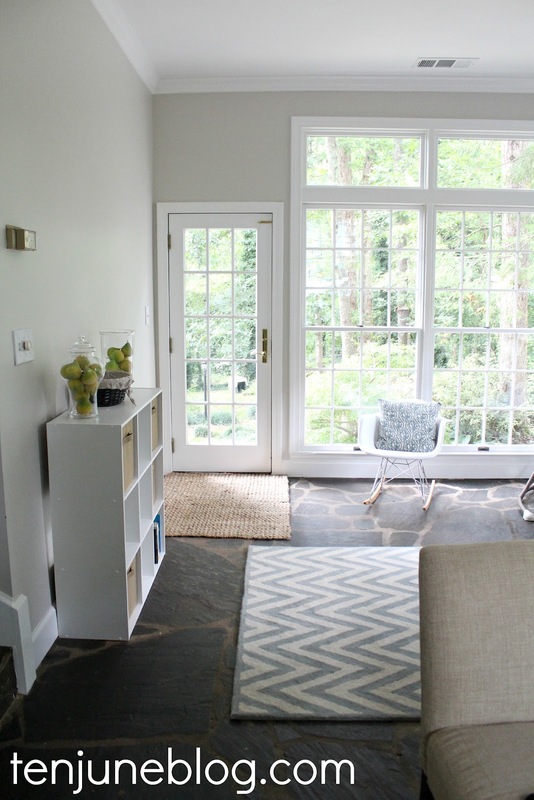 Check out all of the rug options I contemplated here. See how all of little man's gear fits right in?! David and I also bought this cheapola bookshelf and baskets from Target as a quick storage solution. 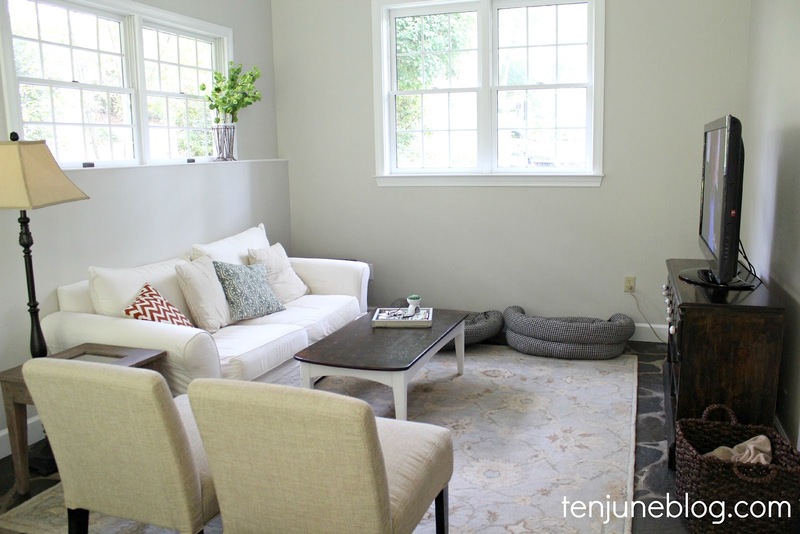 The jute rugs are from World Market. All in all, I'm absolutely loving the space. It is filled with light, which makes spending all day in there a dream come true. 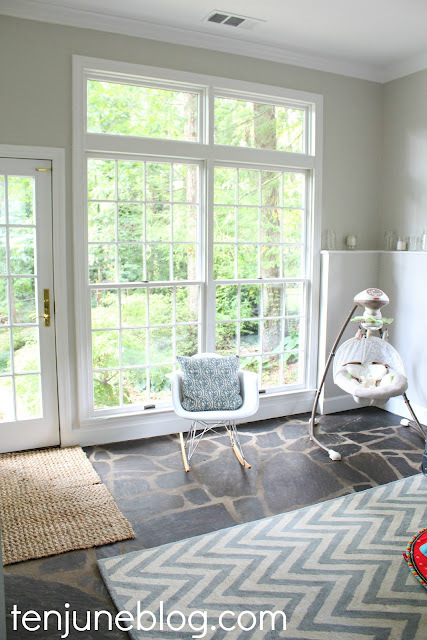 And I absolutely love that my little man will rock in his swing and stare outside at all of the pretty greenery and natural light. It's perfect! Of course, you can see from my list that we still have a few more things to do in the room. But overall, we're on the road to completion! So, whatcha think? Do you want to come kick me the same way I want to kick myself for not making over this room two years ago?! what a huge difference and i LOVE it! loving all the natural light in there! WOW!!!! it looks so light and pretty! awesome job, friend! Wow! Truly transformed! Love it! Love the new color, Michelle! So much lighter and open now. Great job! Looks great! I love that chevron rug. I thought I'd be tired of Chevron stuff by now but nope! This is awesome! I love the colour you chose for the walls. Actually, I just love it all! Such a great room! So much brighter and airier...looks fantastic! Oh wow, changing that paint color did wonders for that room. 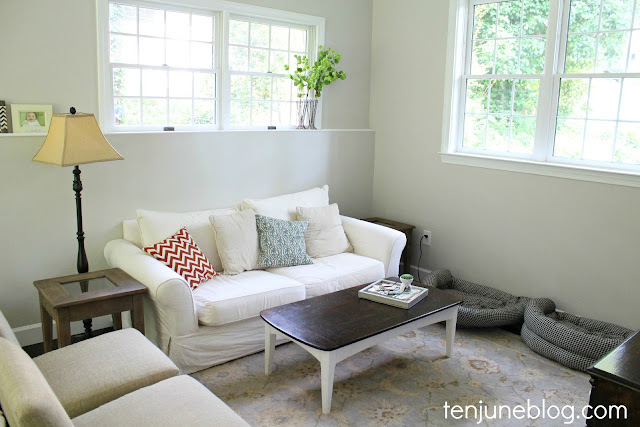 It's so beautiful now - light and airy! Those floors are gorgeous. Looks like a fab place for your family to hang out in. Great transformation! It's nice that you have the room for all of baby's things...our living room is CRAMMED tight with everything! Eek! So what are you doing with the former living room?? I LOVED that swing for Grady. The room looks great. 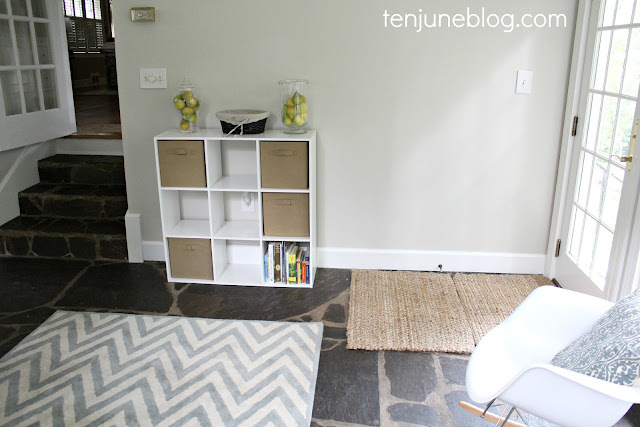 Really love the zig zag rug. And I just want to come hang out there to watch football and play with ten june junior. What a transformation! Paint makes a huge difference, doesn't it? Love that zig-zag rug, too. Now I must know....what will you do with the former living room? Curious to see how that turns out! The windows look so so good with all the new paint! Wow! What a great transformation! 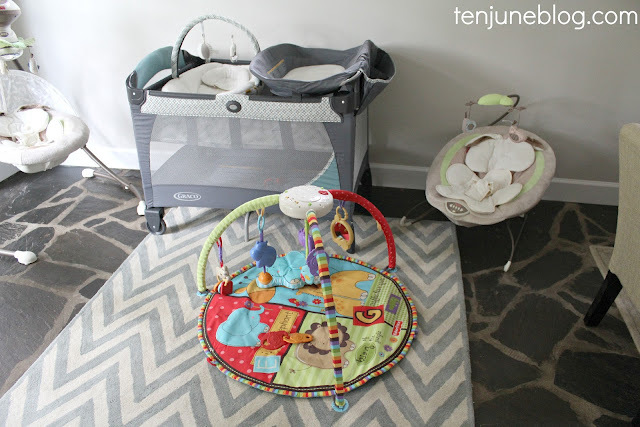 Love that baby has his own "space" for baby gear. I think every new-mom wishes we could have a space for it all to live. And I love how the room gets so much natural light... better for all those pictures of your sweet little boy! Your last line took the words out of my mouth, I can't believe you didn't do that earlier. It looks amazing! WOW!! What a gorgeous space this has become!! 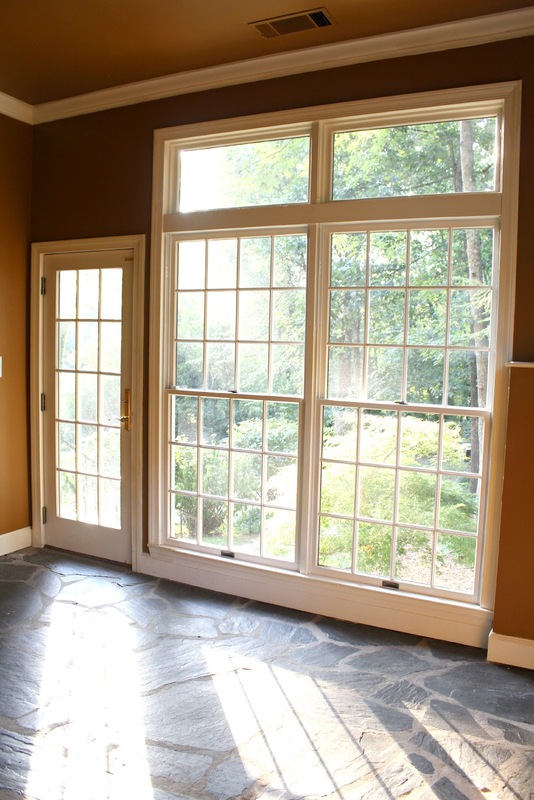 Of course you're enjoying your time in there -- tons of natural light and very serene and comfy. Perfection! Gorgeous! The paint color made such a difference. 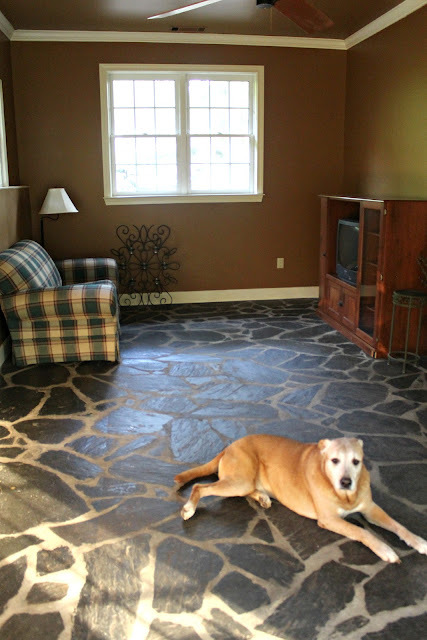 The chevron rug looks fantastic on the slate floor. Love it! It's so bright and cheerful now and those windows are amazing! I'd love to sit and stare out of them too!